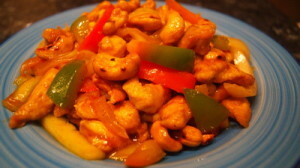 Chicken Cashew Nuts is Chinese dish. Chinese foods are very popular in Bangladesh. Thought I found, it has lots of difference with authentic Chinese cuisine. I like to call fusion food. In this dish you add your vegetables (mushroom, bean, bok choy, snow peas, broccoli, carrot etc). But from add vegetables, you need to be quick. Vegetables need to crisp (don’t overcook). Though after writing this recipe it is looking long and length recipe, it is a quick recipe. Hope you will enjoy with your friends and family. With lots of love thanks again and don’t forget like my facebook page or join my facebook group to keep in touch with me. 1. Cut chicken breast into 1″ chicken strips. Wash it and pat dry it. 2. 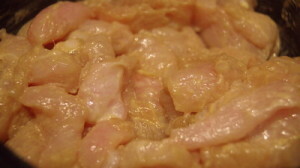 Mix chicken breast with ginger, garlic, soya sauce and corn flour together and let it marinate for 10 minutes. 3. Cut capsicum into 1″ strip and cucumber into thin slice. 4. Roast the cashew nuts till it becomes lite golden and keep it aside. 5. Add oil in pan, when oil ready, add chicken breast pieces in it. Fry it till it becomes lite golden and keep it aside. 6. Mix all sauce ingredients together except cornflour. 7. 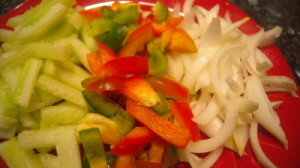 In same add onion and capsicum and stir fry 1 minute. 8. Add cucumber and fry 30 seconds and add sauce mix well. 9. 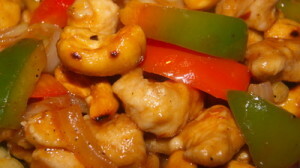 Add chicken pieces and cashew nuts. 10. Add 1 tablespoon water with cornflour and add into the dish. Stir well and remove from heat. 11. Serve hot Chicken Cashew nuts with fried rice.